Dogs and cats can develop small bumps (papules) or larger lumps (nodules) on their skin. The term 'tumor' means an abnormal growth or swelling, and is often used to designate cancer. Often, the word 'lump' also brings the word 'cancer' to mind. There are, however, many other causes of lumps and bumps. The following table includes most of the conditions which result in solid lumps and bumps. The list is rather extensive, so you can understand why a quick diagnosis may be difficult to make and various diagnostic tests, such as biopsies, may need to be performed. The most common causes of solid lumps and bumps are color-coded gray in the table (some may be more common in certain geographical areas). Here are some pictures and descriptions of the more common Lumps and Bumps and if you do find one on your dog, then go to the vet so that they can see exactly what it is and make sure that it is benign. Prevention is better than cure! pea-sized sacs filled with a thick liquid or cheesy substance). 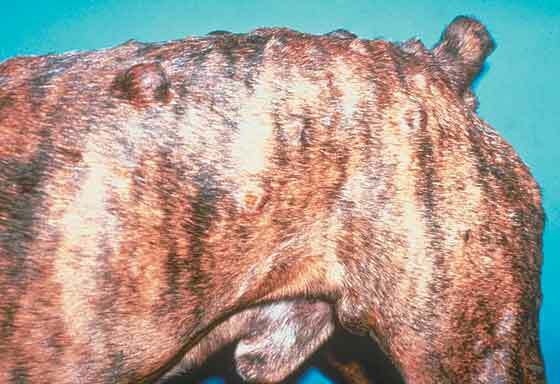 These dog lumps on skin are caused by an oil producing gland called the sebaceous gland. If the gland gets blocked it gets enlarged as small as a pen eraser and as big as 2 inches wide. If the cyst opens you will see a white pasty substance come out. These cysts can be removed with surgery and can refill if punctured. Warts or papillomas, which is the medical term for warts. Lipomas: Canine lipomas are fatty tissue just under the skin surface about the size of a large coin, but could grow to the size of a large ball. They are often seen in middle aged, overweight female or older dogs and tend to appear on the belly and upper legs. Lipoma's are usually seen in Schnauzers, Labs, Dobermans and mixed breeds. It is rare for a lipoma to be cancerous. Sometimes they will develop at the top of a forelimb, making it difficult for the dog to run or walk. If this is the case it will need to be removed with a surgical procedure.